A trip to the suburbs originally intended for snowshoeing at the Morton Arboretum ended up being a trip to the Pottery Bayou in Naperville. A friend lives in near-by Lisle and because it was rainy and gross all day, we had to cancel our plan to try snowshoeing and instead chose to try our hands at painting pottery. There was a child’s birthday party happening at the Pottery Bayou when we arrived, but we didn’t let all the screaming stop us from choosing our figures/dishes to paint. I couldn’t decide if the hubs and I needed a cookie jar, a chips/dip tray or a vase when I spotted a cute little teddy bear figure among the dragons and t-rexs. I immediately thought of a present for the baby. — When I say “the baby,” I am referring to my recently announced niece or nephew. That’s right, my sister is pregnant! I’ve known for some time now and she finally started telling people, so I decided it would be ok to have a fun thing (and a blog post) about making something for Little Baby J. 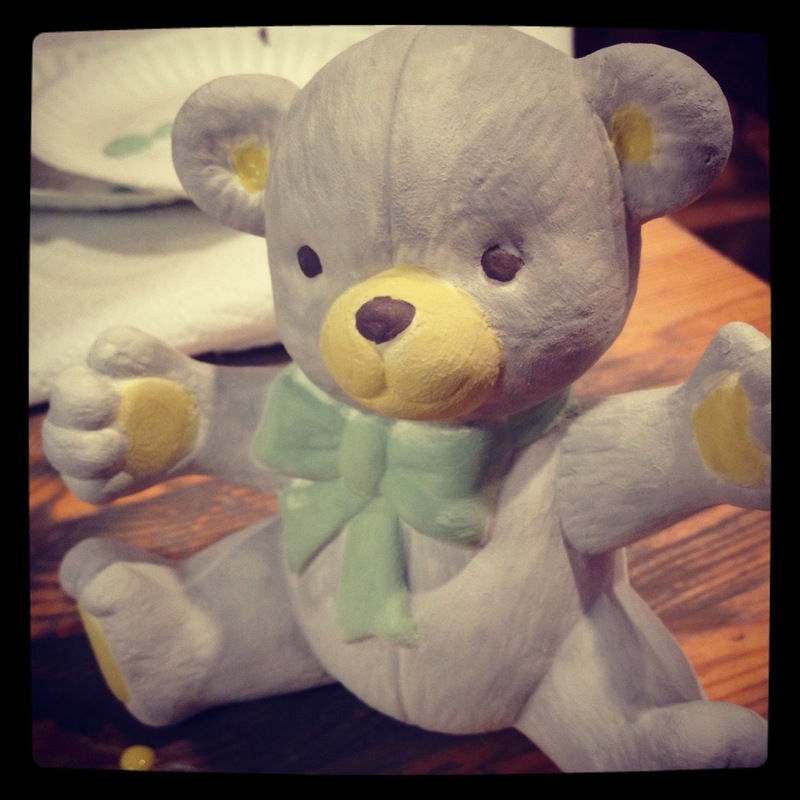 My sister likes yellow and grey together, so I decided to go with a grey bear with yellow accents and a green bow. 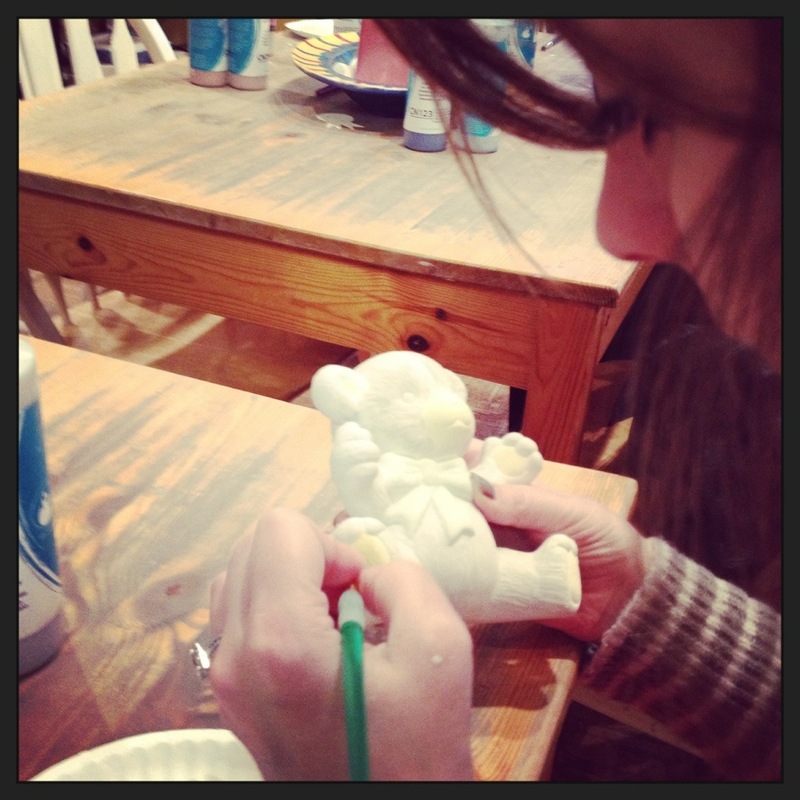 It took me so long to paint three coats of glaze on this bear. For some reason, the detail was really difficult. I think it was just hard for me to get my hands in the right position to do the awkward spots like under his arms and around his face. My friend painted a whole chips/dip tray in the time it took me to do this little bear. But I did it with love and I’m so overjoyed to share this news. They still have to fire it, so the bear won’t be ready for ten days. (Maybe then we can go snowshoeing before picking it up). Oh and on the bottom, I got to write “Love, Aunt Sarah.” The. Best. Heart = Full. You are so sweet! Love you sis!